The following preferences can be set using the Plug-in Development > API Use Scans preference page. 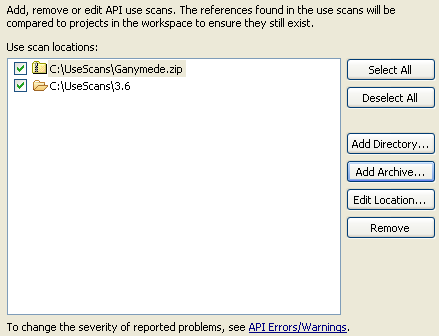 An API Use Scan is a list of references using the ant task or the report tool. The API Analysis builder checks that all references listed in the provided use scans still exist in your workspace projects. Any missing types, methods or fields will be reported as problems in the workspace based on your Error/Warning preference settings. Select All Selects all use scan locations in the list. The API analysis builder will check all locations. Deselect All Deselects all use scan locations in the list. The API analysis builder will not check any locations. Add Directory... Adds a new use scan stored in a directory. Add Archive... Adds a new use scan stored in an archive file. Edit Location... Allows you to change the location of a use scan directory or archive. Remove Removes the selected use scans from the list.